When it comes to entry-level hardware, Pearl's 830 Series leads the pack in quality and value. This pack includes a full outfit of 830 Series Hardware. 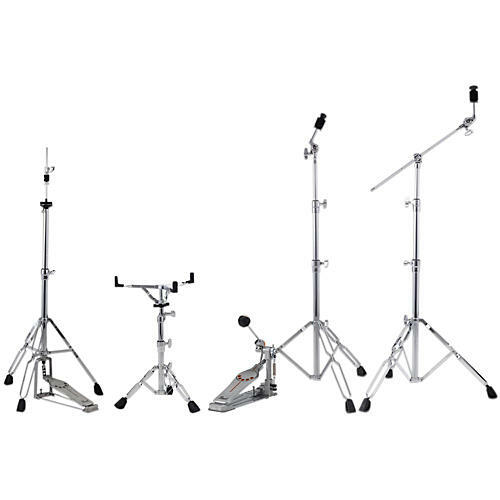 All stands of this set feature double-braced legs for exceptional stability while remaining compact and lightweight. The BC-830 Boom, C-830 Cymbal and S-830 Snare Stands offer Uni-lock technology (tilter for the boom), rubber feet and nylon bushing joints. The H-830 Hi-Hat stand features a chain drive, standard clutch and a "Demon-style" footboard. The kick pedal is a Pearl Demonator - a single-chain drive pedal, equipped with a Demon Style Powershifter longboard. The pedal is equipped with an interchangeable cam, infinitely adjustable beater angle, Pearl' Click-Lock spring tension keepers and much more..